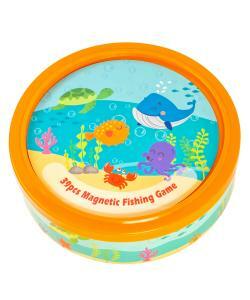 Fun Educational Toy - Magnetic childrens wood fishing sea world game with magnetic rods, fish and sturdy round tub for two players, aged 2 years and up. 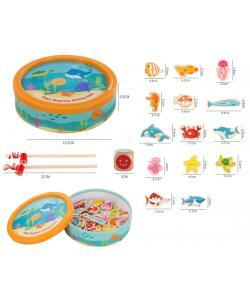 Includes two magnetic rods to catch the colourful marine creatures supplied with the board game! 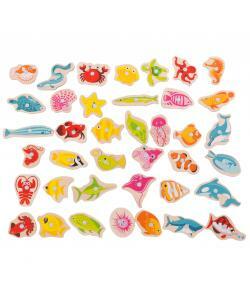 Each of the 39 wooden pieces features a beautifully illustrated fish or sea creature in a variety of different shapes and colours. 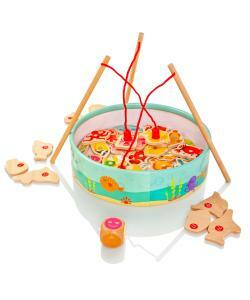 Learning Toy - A fun and creative way to encourage hand-eye co-ordination, fine motor development and counting skills. A sturdy wooden construction that will keep little ones entertained for hours. Made from high quality, responsibly sourced materials, Milly & Ted Toys conforms to current EU safety standards. 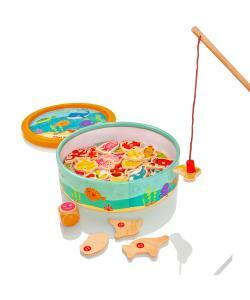 Grab your wooden fishing rod for some puzzle game fun with the Milly & Ted Fishing Game! 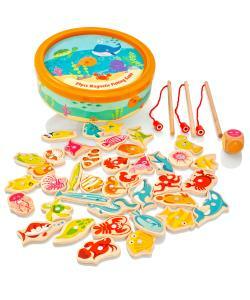 The colourful wooden fish can be hooked up by the magnetic rod and once safely attached, set aside for the count up at the end. Helps to improve concentration, dexterity and co-ordination. Can you catch them all! Made from high quality, responsibly sourced materials. Conforms to current European safety standards. Age 2+ years.